Doris Beam Campbell, of Naperville, IL, and formerly a longtime resident of Owensboro, KY, passed away peacefully on March 28, 2019. She was born on May 11, 1926 in Buffalo, NY, the daughter of the late William and Ethel Beam. Doris grew up in Buffalo, NY. She was a lifelong learner and champion of education. She studied Christian Education at Scarritt College in Nashville, TN. While there she met John D. Campbell, a student at Vanderbilt University, whom she married shortly after their graduation. She served as Director of Christian Education for several years before starting her family. After attaining her elementary education certification and Master's degree in library science at Kentucky Wesleyan College, she worked for the Owensboro Public Schools as an elementary school teacher at Longfellow Elementary and school librarian at Sutton Elementary. An avid reader, she consumed the newspaper cover to cover daily, and enjoyed learning about social and political views of the day. 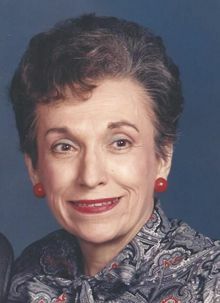 She was a member of Grace United Methodist Church in Naperville, IL and was formerly a longtime member of Wesleyan Heights and Settle Memorial United Methodist Churches in Owensboro, KY, where she was active with the United Methodist Women, WSCS (Women's Society of Christian Service) and was a significant contributor to social charities and the arts. She is survived by her sons, Stephen Mark (Karen) Campbell and John William (Kathryn Robertson) Campbell of Owensboro, KY; her daughter, Jean Elizabeth (Don) Childers of Naperville, IL; her cherished grandchildren, James Robertson Campbell, Margaret Bowling Allen, Elizabeth Anne Zanter, Mark Christian Campbell, Katherine Anne Boro, Daniel Joseph Childers, and Loren Elizabeth Childers-Vasquez; her adored great grandchildren, Miranda Elaine Campbell, Lillian Blythe Campbell, and Malala Anne Boro. She was preceded in death by her husband John D. Campbell of Owensboro, KY and brother William H. Beam of Buffalo, NY. A memorial visitation will be held on Saturday, April 13 at 2:00 p.m. at Glenn Funeral Home and Crematory. A memorial service will follow at 4:00 p.m. Interment will be in Elmwood Cemetery. For those who would like to leave a lasting tribute to Doris' life, memorial donations may be made to the United Methodist Women at Settle Memorial United Methodist Church.